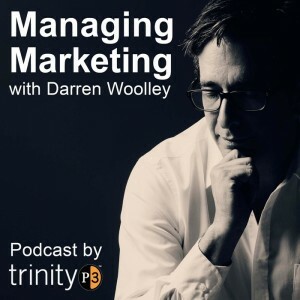 Managing Marketing is a series of podcasts hosted by TrinityP3 founder and global CEO, Darren Woolley. Each podcast is a conversation with a thought-leader, professional or practitioner of marketing and communications on the issues, insights and opportunities in the marketing management category. Ideal for marketers, advertisers, media and commercial communications professionals. More marketing management thought leading ideas and concepts can be found on the TrinityP3 blog. James Welch is a New Business Guru and he discusses with Darren the state of agency business development internationally. Dennis Flad and Nikolas Guido are Directors of Prospire AG and they talk about the business strategy alignment in brand building. Clive Duncan is a Senior Production Consultant at TrinityP3 and he shares his experience in production from all aspects. Andrew Little is the CEO of DDB Australia and here he discusses with Darren the changes in the Advertising landscape. Jon Bradshaw is the Director of Brand Traction and he talks about his thoughts on the essential role of strategy in a world obsessed with short term results and tactics. Greg ‘Sparrow’ Graham is the Group Marketing Director for WPP AUNZ and here he chats with Darren on the media agency pitch process. Steve Sinha is the Chief Operating Officer of the Australian Alliance and he talks about the data in media, marketing and CX management. Ilona Evan is a Senior Digital Consultant at TrinityP3 and she discusses the role of digital media and digital marketing. Virginia Hyland is founder of Hyland Media and she talks about the state of media for independent agencies. Jo Gaines is the AVP Salesforce Data & Audiences & Co-VP APAC Salesforce Women’s Network and she talks about building brands through better customer experience. Zena Churchill, the Director of Max & Buddy Marketing Experts and she talks about the challenges facing organisation in adapting. Chloe Hooper, the National New Business and Marketing Director at media agency PHD and she talks about how pitching can be improved to deliver better outcomes for marketers and advertisers. Alison Michalk, the CEO of Quiip and she shares with Darren the role of on-line community management in a crisis. Peter Miller, the CEO of News Media Works and he chats with Darren on the role of News Media in society. Julian Barrans, the Business Director for TrinityP3 in Asia and he shares with Darren the disciplined business approach to marketing. Kshira Saagar, the Head of Analytics and he talks about the business intelligence. Jane Caro, author, novelist, lecturer, mentor and she chats with Darren on her love of words, her passion for people and the role of education, empathy and diversity in creativity. Mark Jones, the Chief Storyteller and CEO of Filtered Media and co-host of The CMO Show podcast and he talks about storytelling for brands and business. Mari Kauppinen, Head of Marketing, Digital, Channels and Demand Generation at IBM Australia and she shares with Darren her view of changes in marketing for B2B, B2C and what she calls B2I. Professor Mark Ritson talks about the challenges facing marketing and the importance of mastering the principles of marketing to deal with the challenges facing marketers, which is why he developed his Mini-MBA in Marketing. Nick Law, the President of Publicis Communications and Chief Creative Officer of Publicis Groupe and he talks about the role of creativity and the approach to building brands in the digital age. Anne Miles, the Managing Director and Executive Producer of International Creative Services and she shares with Darren her vision of ways marketers can work more directly with creative and production people without the layers of administration and management found in the traditional models. David Angell, the Head of Media and General Manager at TrinityP3 and he chats with Darren about the evolution of digital trading models. Shawn Callahan, award winning author or Putting Stories to Work and co-founder of Anecdote, business storytelling company shares anecdotes with Darren about the role of storytelling in business. Julia Vargiu is the founder of New Business Methodology and the Australian Director of SI Partners Global, and she talks about the stories on how agencies get new business and pitching right. Ben Sharp is a Commercial Business Leader and Mentor, Investor and Non-Executive Director, and Chairman and he chats with Darren and on how he became a LinkedIn Viral Sensation when the BPme app failed and he posted the implications on LinkedIn. Michael Morrison is the Founder of the Blacklight Principle and he talks about his own experience of the advertising and media industry. David Angell is Head of Media and General Manager at TrinityP3 and he talks about the role and importance of robust, relevant and rigorous media. Elizabeth Heusler is a media maverick, communications warrior and strategy zealot and she talks about the changing role and face of public relations. Martin Cass, CEO of MDC Media Partners and Assembly and he discusses with Darren how after leaving Carat, a year at the Wharton Business School. Justin Ricketts, the CEO of Hogarth Australia and he shares his thoughts on the media. John Oldfield, the Ambassador for Worldwide Partners and he discusses with Darren the difference between a trade and a profession. Will Scully-Powers, the Chairman of Datarati and the CEO of Pascal talks about Big Data versus Small Data. Harry Preston, the Managing Director A/NZ of Genero discusses the innovations occurring in the industry. Steve Emanouel, the Managing Director of Spyglaz discusses the strategic flaws in focusing on acquisition and the importance of customer retention for business success. 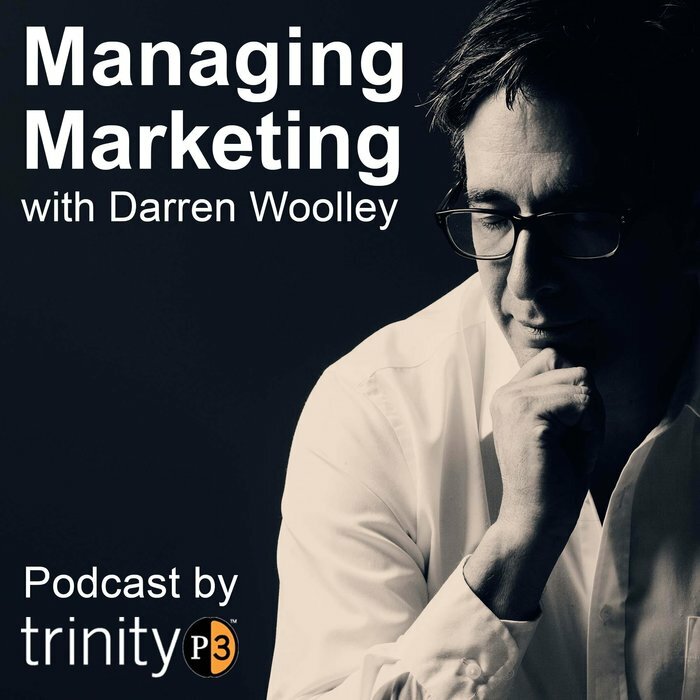 David Angell, the General Manager and Head of Media at TrinityP3 and here he chats with Darren on the increasingly complex role played by media agencies. Ed Pank. Managing Director of WARC Asia talks about the importance of creativity and innovation in business. Erik Ingvoldstad, CEO and Founder of Acoustic Group talks about their focus on helping companies manage their digital transformation. Adam Good, Chief Digital Officer of Dentsu Aegis Network talks about the reflecting on his career on both the marketing and agency side. Andy Lark, Chief Marketer and Chair of Group Lark discusses the challenges and issues facing CMOs and Marketing Leaders today. Ori Gold, CEO of programmatic platform Bench, and here discusses the impact science and technology innovation. Peter Anderson is an Automotive Journalist and chats with Darren about the changes and challenges facing the automotive industry. Liam Walsh, Managing Director of Amobee talks about the increased choice facing marketers today. Ben Tolley, Partner at Clarity talks about the industry mergers. Simone Bartley, co-founder and CEO of Together Co discusses with Darren the concept of brand. Dr Lee Styger, Director of the Executive MBA at Sydney Business School, University of Wollongong discusses the importance of innovation in businesses. Kylie Rogers, Managing Director of Mamamia Women’s Network and Lauren Joyce, Head of Broad, their strategic consultancy talks about how women are driving commerce today. Lyndon Brill, Senior Consultant at TrinityP3 and Darren discuss the sessions and topics that captured their attention at the annual Advertising Financial Management Conference. Tom Skotidas is the Founder and General Manager of Skotidas Consulting Group talks about the power of social media to generate sales. Luke Brown CEO and co-founder of Affinity discusses their approach to digital advertising. Adam Ferrier is the founder of Ferrier & Friends and the founder of MSIX talks about the increasing role of science in marketing. Jon Holloway is the founder of Zuper Superannuation discusses the marketing challenges facing financial services companies. Sharon Foo is the Client Partner at Sparks & Honey dicusses the importance of diversity, data and technology. Kylie Riddler-Dutton is a Senior Consultant at TrinityP3 talks about the agency search and selection process. Annalie Killian is the Director of Human Networks at Sparks & Honey discusses the role of creativity. Alexandra Tselios is the founder and publisher of the BigSmoke.com.au talks about the changes in publishing. Andrew Reeves, Founder and CEO discusses the current agency remuneration and business models. Mahesh Enjeti, Managing Director of SAI Marketing Counsel discusses the issues facing marketers today and the important role of brand. John Chatterton, Chief Marketing Officer talks about the challenges facing marketers, particularly in the Higher Education category. Denise Shrivell is the Founder of MediaScope and discusses the state of the media industry today. Jeff Bullas is the CEO at jeffbullas.com and discuses the role of digital, content and social media in marketing. Sara Delpopolo is the Principal at Axis Legal and the founder and President of the International Social Media Association and talks about social media and the law. Bill Merrick, Managing Director of TrinityP3 UK talks about the challenges facing Marketers and their Brands. Peter Rowe is a commercial and marketing professional who is talking on the commercial management of marketing. Jon Bradshaw, Director of Brand Traction discusses what keeps the CMO awake and night and why. Suzie Shawn CEO, We Are Social Australia talks about the importance of the CEO as the public face of business. Brett Colbert, Chief Procurement Officer at MDC Partners discusses the rapid evolution of marketing procurement. Sean Cummins, Global CEO of Cummins and Partners talks about the death of advertising and the power of creativity. Mat Baxter, Global Chief Strategy and Creative Office at IPG Mediabrands chats about the expanding role of the media agency in marketing. Mike Duda, Managing Partner of Bullish, explores the concept of true performance payments for agencies. Michael Farmer, author of the industry best seller Madison Avenue Manslaughter talks on the changing economics of the advertising business. Bruno Gralpois, co-founder and principal of Agency Mania Solutions talks about the transformation of the agency ecosystem. Douglas Wood, Partner at Reed Smith LLC chats on good agency contracts and good contractual practice. Steve Lightfoot, Senior Manager, Global Procurement at the World Federation of Advertisers discusses the role and challenges of global procurement. Ashton Bishop, CEO of StepChange talks about the disruptive effect of change on organisations. Debra Giampoli, Director, Global Strategic Agency Relations at Mondelez International discusses bad pitch practice and better ways of working with agencies. Nathan Hodges, General Manager of TrinityP3 Marketing Management Consultants discusses the complex issue of ever expanding agency rosters. Gil Snir, Chief Marketing Officer at Benchmarking talks about programmatic media buying and its impact on advertising. Mark Fletcher, Director, Shop Science discusses data, big data and its impact on market research. Mark Reinke, Group Executive, Customer, Data and Marketing at Suncorp Group shares the role of marketing in business and the focus on customer and data. David Indo and Tom Denford, joint CEOs of ID Comms share ideas on defining media value in a media market obsessed with cost. Debbie Morrison is the Director of consultancy and best practice at ISBA talks about the challenges facing marketers in an increasingly complex marketplace. Elliot Polak is the CEO of Textappeal and Newsroom discusses the importance of understanding cultural clashes in a global market village. Rakhal Ebeli, CEO of Newsmodo shares his thoughts on the role of content marketing and brand journalism in building a brand and its audience. Anton Buchner, Managing Partner of Front Foot Marketing discusses direct marketing in the transformation driven by data and digital. Christopher Sewell, Managing Director of the Gaia Partnership chats about sustainable marketing, its role and challenges for marketers and their organisations. Alun Probert, Group Head at GovCom Group talks with Darren about the role of marketing in Government. Jeff Cooper & Ashton Bishop, Senior Partners at Stepchange talk about all things strategy for business and marketing. Trevor Young, the PR Warrior talk about the importance of building a personal brand in today’s competitive environment. Stephen Wright, Managing Director of Calibr8or discusses media agencies and the ways media agencies are assessed. Jon Manning, CEO of Pricing Prophets and Sans Prix discusses the price of everything, but more importantly the value as well. Peter Strohkorb, CEO of Peter Strohkorb Consulting International discusses marketing and sales and the struggle to get the two aligned within organisations. Glenn Granger, CEO at Marketing QED discusses intuition versus fact based decision making and the role of data. Nic Christensen, Deputy Editor of marketing news site, Mumbrella discusses trade journalists, PR and pitches. Peter Le Guay, Partner at Thomson Geer discusses agencies, their contracts and contractors. Cam Carter, founder of Navigare talks about high performing agency relationships. Shawn Callahan, founder of Anecdote discusses Storytelling and where marketers go wrong. You can subscribe to podcasts here.